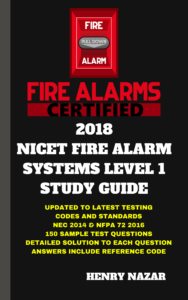 150 questions + DETAILED solution to the question including the method to which you arrive at the answer and the reference code (NFPA 72 2016, NEC 2014 and OSHA standard). Each question is a multiple choice (most are 4 choices) similar to the format of the actual NICET exam. Challenging questions to get you ready for the actual exam. Solutions to questions are very easy to follow. Questions and solutions are essential for practicing for the actual NICET Fire Alarm Systems Level I exam. Includes test tips from the author: an electrical trades instructor with over 10 years of training experience. Get FREE SHIPPING when ordering through Amazon Prime!